No matter how vibrant, action-packed or visually arresting season 1 of Tokyo Ghoul became, I was never totally on board with the series. Though no story could ever really be classed as “original”, the show felt decisively derivative, the ghouls in the title effectively being vampires. As such, I felt I’d seen that story about a good man succumbing to his monstrous half in Anne Rice’s ‘Vampire Chronicles’, the ‘World of Darkness’ roleplaying and/or videogames, ‘Angel’, ‘Anita Blake, Vampire Hunter’ or even ‘Forever Knight.’ Even so, I was prepared to see where season 2 took us. This was a show that certainly had potential, with some interesting characters and some incredible production values. Having done that, this is the point where I say I’m finished with the franchise. Tokyo Ghoul VA (technically √A, as in root A, which doesn’t translate so well to URLs) commits all the sins of the first season, and then some. What we have here is a string of well-made sequences that had zero emotional impact because I cared not one jot for the characters involved. I’ve sat through uninspiring anime many times before, only to be stunned by a heartfelt sequence out of nowhere (I’m looking at you, Tales of Earthsea and Guilty Crown). That didn’t happen here, however. 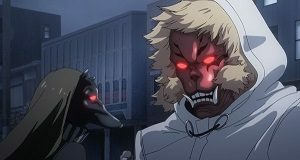 Tokyo Ghoul starts off with vague character outlines, and then instead of colouring in those lines, giving us a bit more to work with, it simply introduces more characters. And more. And more. So when the show is aiming for operatic tragedy (which it attempts on many occasions in this collection) it simply falls flat. When we left Kaneki, he had joined Aogiri Tree in an attempt to both embrace his monstrous half and protect the ‘good’ ghouls of Anteiku. In √A, we get no real explanation of how he thinks this will pan out. Nor does it deliver any twists and turns. The narrative meanders aimlessly, with ghouls murdering the people of the CCG (Commission of Counter Ghoul) and the CCG murdering the ghouls. I mentioned in the review for season 1 that the show flirted with the question of who the real monsters are, especially considering how unhinged some of the ghoul hunters can be. This could make for some interesting moral quandaries. Alas, in √A it means that I hate both sides – ghouls and hunters. They’re equally dislikeable, so I’m just left to soak in the senseless violence. The animation is impressive, however I’m not a fan of the general approach, which is to prioritise speed a fluidity over everything else. Characters are often clearly moving against flat backgrounds with little regard to their placement in the space. That being said, it all looks and sounds brilliant on Blu-ray. The commentaries with the English-language voice cast are always entertaining on Funimation releases, and the ones here are no exception. Getting through these 10 episodes was such a struggle for me. If you were particularly enamoured of the first season, then you might enjoy this one, but I’ve lost interest in this property. Tokyo Ghoul √A Complete Season 2 is available now on DVD and Blu-ray from Madman. This entry was posted in TV Series and tagged Action/Adventure, Anime, Horror, Tragedy, TV series by Stuart Wilson. Bookmark the permalink.